Pale pale yellow with hint of green. From the label I read 7% was matured in seasoned French oak barrels for four months, which has added complexity and bready lees characters. It is a rich and concentrated sauvignon blanc, and has improved with aging. 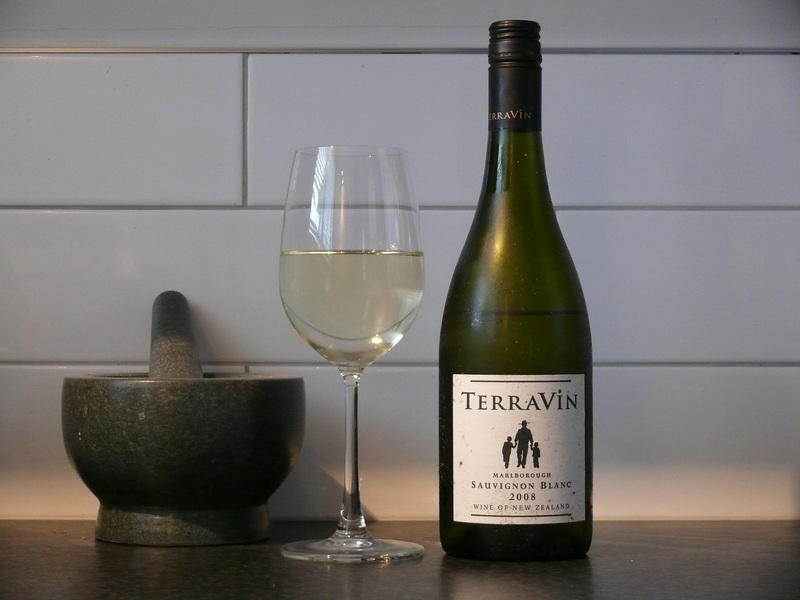 Creamy ripe pears and tropical fruit aromas, and vanilla from the oak; mouthcoating, soft, sweet and intense fruit in the mouth, and a hint of capsicum at the back. A lovely long finish. Some yummy secondary flavours are starting to appear, so this was a good time to open. It shows the value of aging savs that have oak treatment. And my cellaring gave it a manky label, nice one..
..and it was free from Rumbles when I bought a 2004 Terravin pinot noir. I hope the pinot is as good as this! ← When I grow up I want to pay NZD3000 for one bottle of wine. And after I drink it, I’ll put a candle in the bottle.